Keeping your balance on the board does not mean you have learned all about skateboarding. It requires proper knowledge and know-how of the complete series of the moves, tricks and stances involved in it. With that in mind, the Rage store at Dubai Mall opened up a skate bowl above its main skate shop in 2009. The main purpose of its establishment was to provide the young generation of Dubai with an opportunity to polish their skating capabilities. This uniquely designed skate bowl took a long time to complete and is accompanied by Rage’s own signature. Skating related lessons are conducted in the bowl under the guidance of the well-known and professional skater. The Rage skate bowl is not only a great excuse of fun for kids but also plays a vital role in making them confident, boosting their self-esteem and improving their social skills. It is among the requirements of modern age and an amazing medium impact aerobic workout for various age groups. Skating lessons are conducted in the uniquely designed skate bowl of the Rage store. Children under 14 years of age are the target customers of Rage. This pretty small bowl is a covered facility with A/C that is an ideal size for children to leans all the basics of skate-bowling in Dubai. Bubbles and Booba, Baker and Spice, Dusit, Rose Rotana, Nandos Burj Khalifa, Burj Park etc. The Rage Skate Bowl operates from 10:00 to 22:00 between Sunday and Thursday. During weekends, it remains open until midnight. Children under 14 years of age can use the Rage Skate Bowl in two hour sessions for AED 25. Keeping the safety of your kids in mind, you can hire a helmet for AED 10. Moreover, lessons are conducted for AED 100 per hour and there is no previous experience is required. 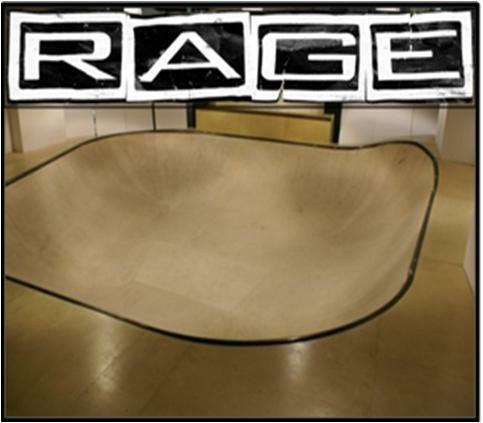 As stated above, the skate bowl is functioning under the Rage shop, so, once you reach here - you reach the Rage Skate Bowl. There is no metro station in the area of Rage shop. The best thing you can do is, get into Bus Number F13 to reach the Dubai Mall, LG Main Entrance 1 Bus Station, which is the nearest bus stop to the Rage Shop. It is just 140 meter that makes a 2 minute walking distance. Once you arrive at this bus stop, simply heat South-East, walk straight for the next two minutes and find your destination right in front of you. View Map.